2011 Fellow, Kerstin Forsberg is a biologist protecting giant manta rays by helping fishermen pursue ecotourism as an alternative income source, training them alongside ecotourists to collect data on the distribution and abundance of this species. "Giant mantas are extremely vulnerable and, in particular, marine environments are severely threatened. We need to engage more people in conserving them. There is a lot of work to do," says Kerstin. The Rolex Award will enable Kerstin to involve more fishermen in the project and create locally-driven ecological monitoring. But her long-term aim is to develop a model for sustainable community-based initiatives that can be applied worldwide. 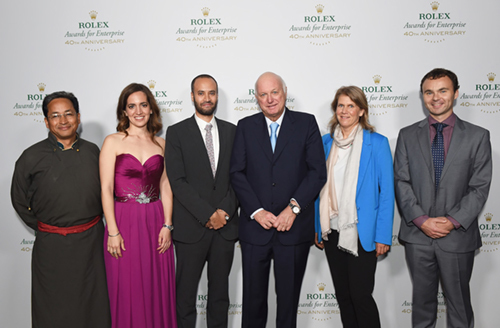 Rolex usually presents five Awards for Enterprise every two years; however, for this year's 40th anniversary of the Awards, 10 prizes were announced: five for Laureates and five for Young Laureates (aged 18 to 30). Each Laureate receives 100,000 Swiss francs and each Young Laureate receives 50,000 to advance their projects. Four women and six men from nine countries were chosen by an international jury of 12 eminent experts. They had been shortlisted from among 2,322 applicants. All of the Laureates were honored at a ceremony on November 15, 2016 in Los Angeles, California. The event was held at the Dolby Theater, home of the Academy Awards. Kerstin was presented with her award by the marine biologist, Dr. Sylvia Earle who has pioneered research on marine ecosystems. Since 1976, Rolex has recognized extraordinary individuals who possess the courage and conviction to take on major challenges. Each Award is given for a new or ongoing project anywhere in the world and supports enterprising work in three areas: the environment, applied science and technology or exploration. Winners are chosen by an international jury of independent experts, which typically include explorers, conservationists, scientists, doctors, educators and innovators.